Credit cards are essential in today’s fast-paced world. More often that not, these plastic cards take precedence over cold, hard cash these days. When deciding which credit card to use, most of us take into account factors like APR, fees, maintenance costs, and cash-back savings. However, for the richest of the rich, these concerns are nowhere near as important as things like cards that don’t have limits, exclusive luxury benefits, and rewards points on extravagant items. The 5 cards on this list are only for the supremely wealthy. These credit cards cost much more than most of us would ever care to pay; however, the perks that these credit cards give you are simply unmatched by most cards available to the general public. Check out the 5 most exclusive credit cards for the mega-rich! 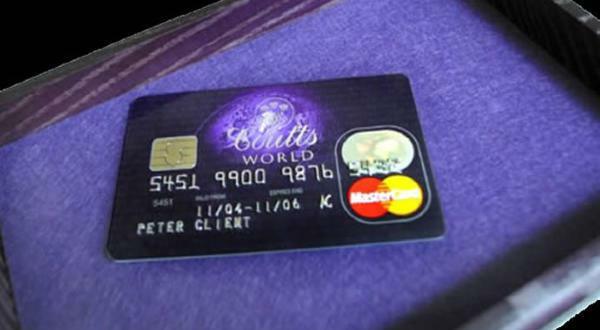 Available only to citizens of England, the Coutts World Silk Card is a credit card that is a favorite of British elites, including Queen Elizabeth II. This credit card comes with an absolutely insane 49.1% APR, so you probably won’t want to carry a balance on your account for too long. Then again, if you can afford this card in the first place, it’s quite possible that insane interest rates don’t bother you. The Coutts World Silk Card is available only to those who have at least $1 million in a Coutts bank account – a number of people that barely exceeds 100. If you’re lucky enough (and rich enough) to qualify for the Coutts World Silk Card, you’ll enjoy luxuries such as a 24/7 concierge service, access to exclusive airport lounges, and private shopping at designer stores, to name just a few benefits. Better start that Coutts savings account now!